The Deal Manager was built from the ground up to include Document Management. This isn’t a 3rd-party add-on, separate software, or an oversight; it’s a fundamental and tightly-knit integration. 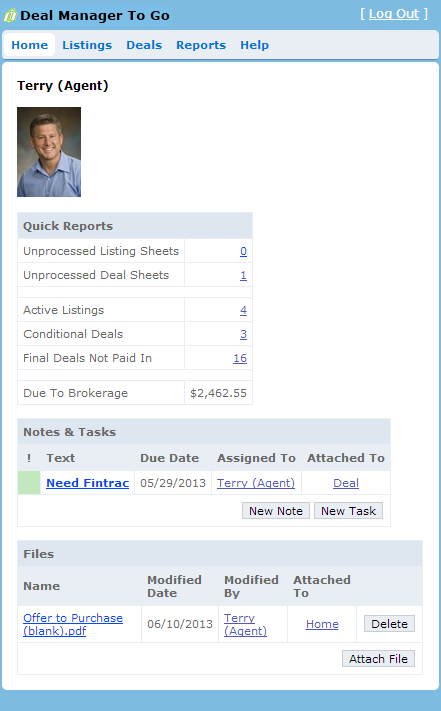 This feature allows you to attach documents to deals, listings, contacts, vendor invoices, customer invoices, bank reconciliation, T4A processing, and more. The most reliable and convenient way to store, edit, and share all of your documents has finally arrived. You’re welcome. We work and live in a world that thrives on new technology. Where faster and now are almost too late. This is why our document management solution was created, to help eliminate the constraints of the almost obsolete 9-5 office clock. To help eliminate the need for overstuffed corporate offices where deals used to happen. We all know that more deals get done over kitchen tables then they do within our closing room walls, so why not make those deals easier to process? That’s where the Deal Manager comes in. We allow scanned documents to be entered into the deal process as close as possible to the point of entry. This allows all parties involved with the deal with a secure, easy to reach place. An easy to reach place that your agents can access via the Internet 24/7 – right after coffee and small talk at the Jones’. In a time where minutes can translate into days for a client, wouldn’t you rather rest easy knowing that your agents can work more efficiently and conveniently? With the Document Management solution you can do just that. Files are stored in one central place where agents can easily access current and past transactions and recall any deals previously worked on. It’s a central hub for everyone in the office to access files; making conveyancing easier, closing deals faster and auditing easier. 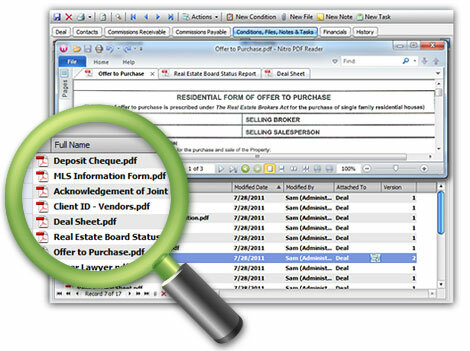 Thanks to the Deal Manager’s Document Management feature, conveyancing has been delightfully simplified. With all your documents secured in one place you can quickly combine and attach files to be forwarded to lawyers and other brokerages with ease. Now you can simplify your business, and your day. In many cases these ‘efficient’ solutions piece-meal other solutions together in order to make up for shortfalls in programming, knowledge, or both. We can honestly say that our back office real estate solution is made up of just one solution. Not a bunch of Band-Aids holding many programs together in a precarious manner. We aren’t missing any of the key pieces to make your back office puzzle come together either, we have a complete back office solution to take you all the way through the stages of a deal – from entering the listing into the system , right through to trust accounting and closing. 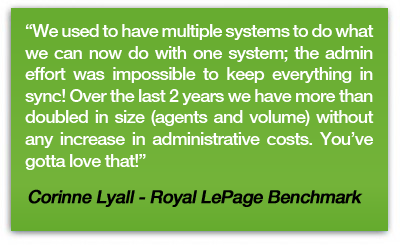 That’s what our software does for your brokerage – it keeps you organized. We’ve put together a comprehensive set of features within our back office real estate suite to make life around the office not just tolerable but easy. We help you with the three big M’s – monitoring, managing and maintenance. Our business management services keep the communication flowing and allow brokers, administration staff and agents to stay on the same page. All your doc’s in a row. To go. The Deal Manager To Go now gives you the freedom of having what we like to call a ‘pocket office’ without having to buy new pants. We’re not kidding. It’s all in there. We know you spend a lot of time on the move, which is why we’ve taken our software to yet another level and made the Deal Manager available to you right from your pocket thanks to the Deal Manager To Go – our web app to trump all real estate web apps. Why did we make this extremely convenient feature you ask? We wanted to find a happy medium between hiring a packing mule and running an office out of your van. Kiss those days goodbye and say hello to instant access to all your deals from virtually anywhere. Enough with the teasing. Here are some features of this revolutionary technology that your agents will surely drool over. Enter Deal Sheet Online: Are you still a victim of constant commuting no thanks to your paper-based office? See, we find that driving back and forth from the office, to the client, to properties, back again, and repeated, is a strenuous process. Don’t you? So let’s sort that out by putting your ability to enter deals right in your pocket, instead of a pile on your desk. Quickly access the deal and transaction documents from your smartphone, tablet or laptop, fill them out, and send them off to finalize your ‘easiest on-the-go deal ever’, courtesy of the Deal Manager To Go. Deal Archives: New or old – it doesn’t matter. When you need to see a deal, you need to see it NOW. Access archives of your previous deals, or copies of your ongoing ones, right from the palm of your hand. No more dust-piled files, mountains of paper and cluttered desks. Thanks to the Deal Manager To Go, now you have the convenience of accessing any and all of your deals on the move, without the inconvenience of pushing a file cabinet around in a shopping cart. Performance Reports: Not sure how you’ve been performing lately? Feeling under par? Over achieving? Floating? No clue at all? Find out exactly where you’re at with access to past and present performance reports. Whether you’re looking at this month, last month, this year, last year; it’s all in there. Access performance reports by month or year for simple revenue and deal summaries right at your fingertips. Now you can outperform all the time, every time, so get out there and start swinging with confidence! Monthly and Annual Expense Reports: When you’re on the move and need to check some numbers over, there’s nothing quite as frustrating that realizing your monthly expense report is way behind you in a folder at the office. So we’ve devised a way to sort out this issue once and for all – monthly and annual expense reports accessible right from your smartphone, tablet or laptop. Now you can check your expenses more accurately, consistently and conveniently than ever before. The Deal Tracker brings unparalleled communication effectiveness to the table. It’s essentially our answer to all your problems. 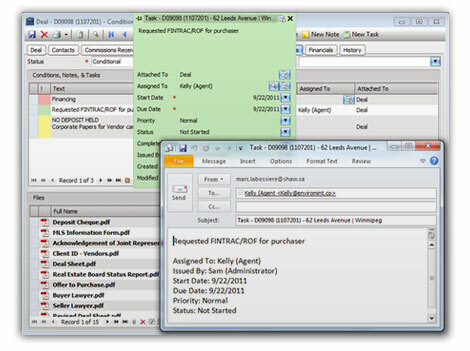 Throughout the deal process, the Deal Tracker updates all parties involved, simultaneously upon each milestone. These pivotal moments in the deal process such as offers, conveyancing, and possession should never be overlooked, so now you can give them the attention they deserve thanks to the Deal Tracker. As an agent you’ll love the gentle reminders that not only you’ll be receiving, but also the effortlessness of the process. You no longer have to fret about sending 100’s of emails to remind lawyers, to remind clients, to remind you that you need to be reminded – sounds uhhh-mazing right? Because it is totally uhhhhhh-mazing. Stay in touch with every party to the tune of set and forget. Once you see how easy it is to track your deals in real time and how much communication time you’re saving, heck, you might just go out and do something crazy, like close more deals. As a broker owner you’ve finally unlocked the secret to more agents. The Deal Tracker is unparalleled in the real estate accounting realm and trust us when we say the power of persuasion runs deep. 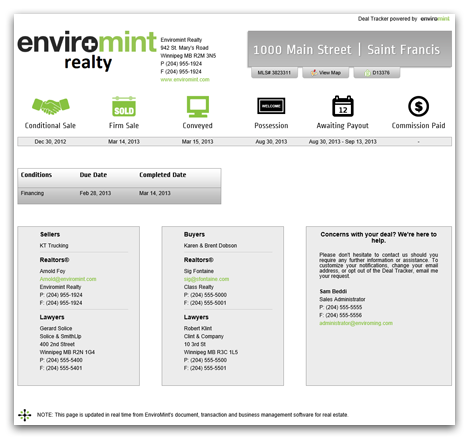 All the other broker owners that aren’t signed up with EnviroMint’s Deal Manager solution better hope that their agents on the other side of an EnviroMint deal are wearing respirators, because once they do a deal with a brokerage using this slicker than slick system, they’re going to catch the fever. And the only way to treat the fever of efficiency and productivity is to run to the brokerage with the cure and find out more about the effectual fanciness your brokerage is touting. Don’t believe us? Keep reading and find out more. The deeper you go the better it gets.